Portable food cutter with a cover for on the go baby and toddler feeding. Single Quick Split: 45% off on amazon – no coupon code needed! Quick Split 2 pack with gift bags: 50% off on amazon – no coupon code needed! 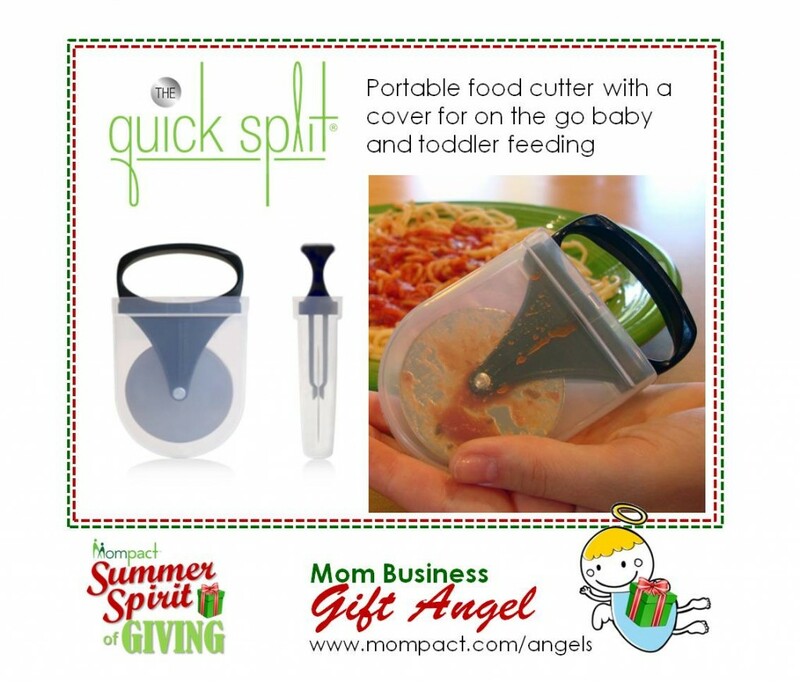 The Quick Split is a portable food cutter with a cover – it is a diaper bag must have for on the go parents, allowing you to quickly cut your kids’ food into safe, bite sized pieces when you are out to eat anywhere. The Quick Split offers a faster, easier and less mess way of getting the job done. It is constructed of BPA free plastic and stainless steel, it has a child proof snap on cover that keeps the mess contained until you get home, it attaches to the key ring holder in a diaper bag or purse, and of course it is dishwasher safe. We all know how handy our pizza cutters are in the kitchen – we use them to cut our kids’ food all the time, and not just when they are eating pizza. The Quick Split offers that same convenience no matter where you are. Fast food? Camping? Picnic? We’ve got you covered! No more struggling with plastic utensils – The Quick Split is so much faster and easier to use that you’ll find yourself reaching for it even when you have the option of using real silverware. The most innovative part of The Quick Split is the cover – it is 1″ thick, allowing the cutting wheel to be completely covered with food when the cover is snapped back into place. There is no need to waste time cleaning off the wheel after use; simply snap the cover back on, toss it in your diaper bag or purse, and place both the cover and cutting wheel in the dishwasher when you get home. As an added bonus, the snap on cover makes it child proof, so there is no chance of your little one hurting herself if she gets into the diaper bag. The Quick Split is patented, mom invented and USA made.